I took my daughter and her girlfriend to see FUN HOME at the Public Theater. It was really great - it was funny and sad and surprising and really well done. One of the best theatre pieces and the best, bar none, musicals I've ever seen. We had amazing seats - I didn't realize how good they were when I bought them - right in the front right next to the (small) orchestra. We were so close that at the end, although we wanted to join in the standing ovation, we were afraid to stand because we would have been almost in the faces of the actors taking their bows. And Joan Rivers was there too - she was in my way when I was trying to exit up the stairs. We had better seats than Joan. The show closes next week. With any luck it will appear elsewhere, hopefully Broadway, soon. 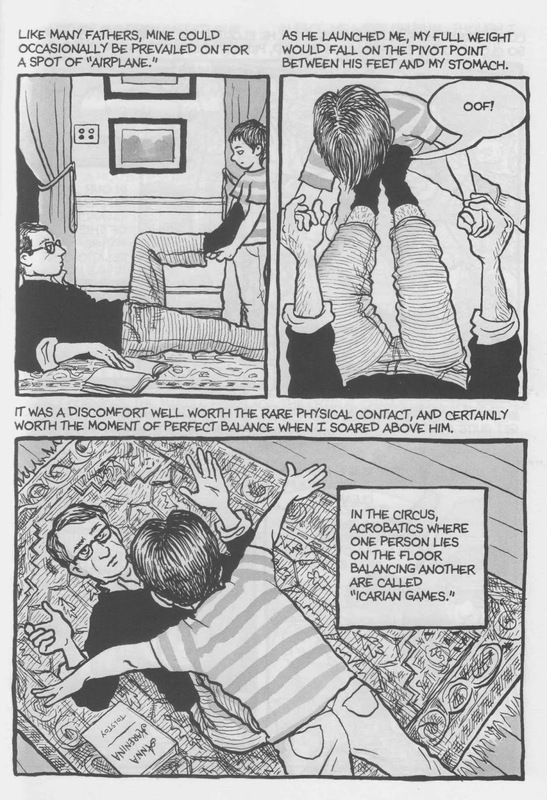 The version of the bottom panel of this Alison Bechdel comic page from the original comic book version of Fun Home, as well as a version of the caption was projected on the wall at the end of the musical. Yes, I cried at the end. What have I been up to these past eight years? Is it possible to praise Mac Wellman too highly?